With the one, big, happy family that she has, any woman would admire Ina Montecillo as the embodiment of a perfect mother. BUt after than 40 years of doing everything for her family, she feels that her children don’t need her anymore. Ina then embarks on a journey of once again making her children proud of her that surprisingly lands her as the president of the Philippines! Ina revolutionizes the Philippine Politics by running the country not as a serious and uptight leader but as a hilarious and caring mother. Because of this, she gained the trust and the support of the Filipino people, but just as she starts to become the President that everyone loves, she also changes and becomes the mother that her children hate. In the end, Ina has to make the hardest choice of her life-becoming the mother of her own children. 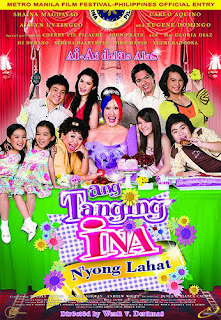 Ang Tanging Ina N'yong Lahat is a 2008 Filipino comedy film starring Ai-Ai de las Alas and Eugene Domingo. It is the sequel to a 2003 comedy film Ang Tanging Ina. It was released on December 25, 2008 as Star Cinema's official entry to the 2008 Metro Manila Film Festival. The film grossed a total of PHP 204 million and it used to be the all time box office hit in the Philippines until Star Cinema's You Changed My Life beat it. As of April 2009, it grossed ₱229.96 million pesos. Ai-Ai de las Alas reprises her role Ina Montecilio. It also stars Eugene Domingo as Rowena, Carlo Aquino as Tri, Alwyn Uytingco as Pip, Shaina Magdayao as Seven, Serena Dalrymple as Cate, Jiro Manio as Shammy and Yuuki Kadooka as Ten-Ten.